We have been learning what it means to run the way of God’s commandments. 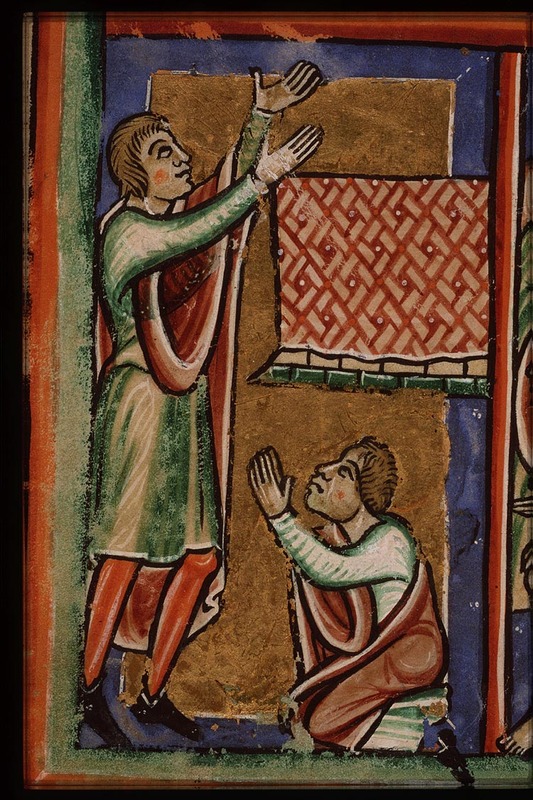 For many Sundays we looked at the reform and the ordering of our loves – so that desire in us is not misdirected within us (we humbled ourselves under God waiting to be lifted by Him), nor squelched by others, but rather released towards its true end – the love of God and the love of our neighbour. We are beginning to learn about something new that happens in us as the expression of our love outwardly is ordered, that is, as we trust in and are found by God to be faithful in the little things, the way we show our love outwardly, the way we respond to earthly desire, that God can trust us with great things – spiritual gifts, heavenly treasures, that we can partake of and that are revealed in us. Our walk in faith is accompanied even now by a certain knowledge and love of Jesus. Remember last Sunday – Christ cleansing the Temple – prayer is being awakened in us and all the discordant voices within us are being quieted down by Jesus. We are becoming aware that Christ Himself is dwelling in us, in the temple that is our body, and he is teaching us daily as we listen for his voice. Faith in Christ is being transformed into knowledge and understanding. This is the first fruits of the resurrection life now in us. And this is a new way of being Christian. Our lives are being founded upon Christ in a more solid way, we are tasting and delighting in heavenly treasure inwardly… or are we? In this morning’s Collect we prayed that running the way of thy commandments, [we might] obtain thy gracious promises, and be made partakers of thy heavenly treasure. It seems possible that we could run the way of the commandments and not obtain God’s gracious promises or partake of the heavenly treasure. And this is precisely the case with the Pharisees in the parable that Jesus spoke in today’s Gospel. The Pharisee – he is not an extortioner (meaning he is honest in business, not obtaining things by violence or intimidation), he is just in his dealings with others (honest), he is not an adulterer but faithful to his wife, and he fasts twice in the week, gives tithes of all he possesses. Here is an example of someone who is following in every way outwardly the precepts of the commandments – no one could complain about his dealings with other people. (not murdering, committing adultery, stealing, bearing false witness, coveting). He’s also following outwardly the other commandments – worshipping the one God in the Temple, not idols, he is as far as we know observing the Sabbath and honouring his parents, and not using the Lord’s name in vain...or is he? And this could be each one of us, when our lives become ordered outwardly through our faith in Christ. A regular pattern of worship, not bowing before statues, doing our duties outwardly to our parents (if they be living), generally honest and faithful, and relating to the good things in creation in a temperate way. And yet Jesus says that the Pharisee in his prayer will not go down to his house justified – that means, he will not be right with God, he is not living in truth, he does not know deep peace, he is not obtaining God’s gracious promises nor partaking of God’s heavenly treasure. Here’s the astounding thing about the Christian faith. It is possible to do everything right outwardly and still fail to obtain the true desire of our hearts – to be filled with Christ, filled with the Spirit, and lifted even in this life into the heights of heaven – to live the resurrection life. It is a matter again of something hard but so important to understand – it is this distinction between the outer and inner life, between the outward man, and the inner man. We have to turn the focus of our attention now, not just to how we appear to others outwardly, but to what is going on in our minds, in our thoughts, inwardly, to our inner motivations for all that we do. - Are we being righteous out of a love for God who calls us and makes us righteous? Jesus says today that there is a test that we can give ourselves this morning to see our growth in holiness outwardly is accompanied by a new heart. Jesus spake this parable unto certain which trusted themselves that they were righteous, and despised others…And here is the key…and despised others. Think about what is happening here if we look down on others: We’re saying our righteousness is something we did and deserve – it is no longer a matter of God having showed mercy on us, and given us the grace to order our lives. We are trusting in our own righteousness. We’ve forgotten the voice of Jesus, the presence of Christ in our soul, and his voice has been replaced by our voice. We’ve chased Jesus out of the Temple and our inner beauty, Christ in us, is lost. In the Epistle this morning we have the example of St. Paul put before us. And this is a wonderful example when we remember who St. Paul was before he met Christ and who he became in Christ. And in this morning’s Epistle St. Paul speaks about having seen Jesus risen, and how that knowledge has not been received in vain. He tells us he worked harder than all the other disciples, yet acknowledges it was not him but the grace of God working in him. Jesus didn’t die for us that we might become righteous Pharisees, satisfied with a certain outward orderliness of life. Rather, Jesus died and rose again that we might continue in the journey towards God inwardly – not just believing in Jesus, but knowing him inwardly, and experiencing his resurrection in our life now. As we grow in the Christian life we begin to see ourselves and those around us more plainly for who we are. For each one of us it is always the case that some are less mature than we are and some are more mature than we are. We don’t look at those who are less mature and think ourselves better. Rather, we recognize every one of us as covered in the righteous blood of Jesus and so we are accounted righteous in God’s eyes and are being made righteous by God. We are all caught up in a movement of ascent towards God, deepening in holiness and ever deepening in our love of God and neighbour. We don’t despise those who are failing and repenting in our midst, because we are all failing and in need of repentance continually. Instead, we find ourselves reaching out with a loving hand to those whom we can help and ever in need of those above us who reach out to us – more mature Christians and the help of the saints and the whole angelic realm sent by God to help us on our journey. We see ourselves as forever in need of mercy and the recipients of mercy and so can easily show mercy to those around us. It’s not Jesus' way to despise us who are unrighteous, so why would we despise those who are unrighteous in our midst? And in this state we can go to our homes justified. Humble, in amazement that we are all living and flourishing because we are under the mercy of God. This is why our liturgy, the words we use in daily prayer and in our worship Sunday by Sunday, are just peppered (spiced!) from the beginning to the end with the cry and with the joy of the gracious words “have mercy”.